It was with all intention to mind our own business this morning at Target, and hunt down some back to school specials on large clear plastic tubs to help store and organize all of the many articles of the Preserve, but it was not to be so! 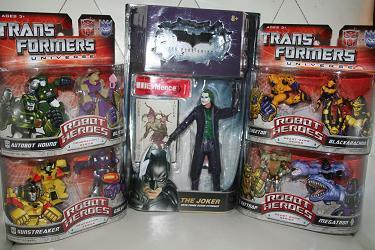 After vaguely keeping an eye out for the Dark Knight Movie Masters figures by the Four Horsemen, we were astonished to find the super rare Joker figure there on the pegs! Turns out of course that the new wave ships with the Joker so as to make it a little less rare, and eBay already tells the tale - I'm sure that's the only reason it was left unscalped at the late late hour of 9am! Nevertheless, it's a great figure, and we're glad to have it in the collection without eBay Antics. Not to be settled with that, the new (first) wave of Transformers Classics 2.0 Robot Heroes finally made it to this town, and of course joined the haul. These figures have been high on our list since we saw them way back in February at Toy Fair, and they look fantastic. Collector Tip: There is apparently a packaging variant on the Sunstreaker vs. Galvatron set - the logos in the upper right corner are either Movie 2007 style, or will match the other Heroes on the shelf - watch for it!